Yes Bank offers both mobile banking and net banking facilities. You can enable both features online using debit card. You can also view your account balance and statement through missed call banking. 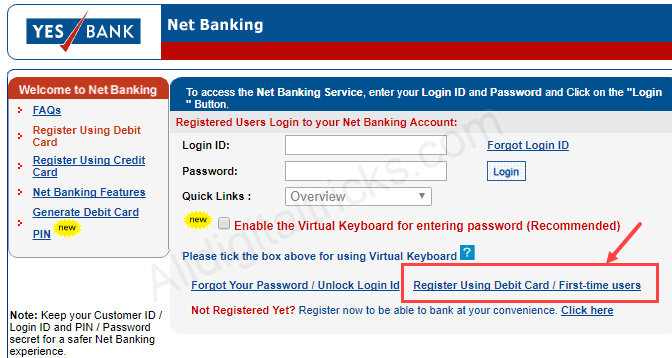 Here you will see how to activate Yes bank net banking facility online without visiting bank. Through Yes Bank Internet Banking you can manage your account online. You can make fund transfer, view account balance, manage debit card, Cheque book and much more. See step by step process to enable yes bank net banking facility. To Register for net banking facility all you need customer ID, Debit card & PIN which you receive after account opening. Make sure your mobile number also registered with bank account to receive OTP. 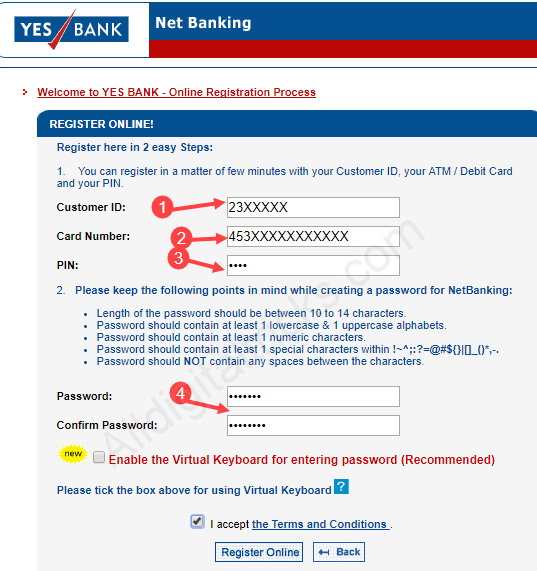 There are two ways to Register for Yes bank net banking. 1: First visit https://www.yesbank.in/ and click on LOGIN — Retail. Now click Get started. 2: In new window click on Continue to net banking. 3: In login page, click on Register Using Debit card/first time user. 4: In next screen, enter customer ID, Debit card number & PIN. Set your login password and click on Register online. 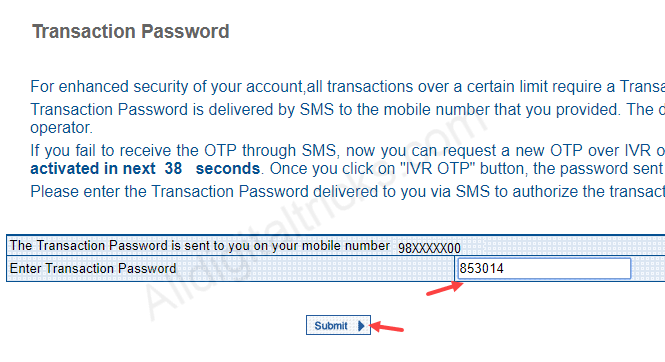 5: In next screen you need to enter transaction password (OTP) which you will receive on registered mobile number. Enter it and click on submit. That’s it you have successfully activated yes bank net banking facility. Now open login page enter customer ID and login password to access your account online. You can also Register for Yes bank Internet Banking through mobile banking. 1: Install Yes Mobile Banking application which available for Android and iOS. 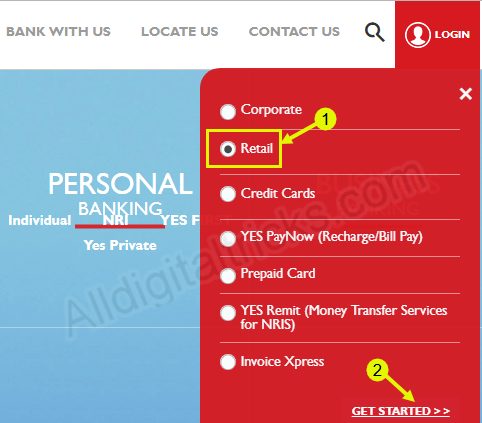 2: Open Yes mobile and tap on Register for Retail net banking. 3: Next, enter your customer ID, Debit card number & pin then submit. 4: In next screen enter OTP and set your login password. That’s it, now login to your account. So by following these 2 ways you can activate Yes bank Net Banking facility online without visiting branch.